Kazuya's older sister, and the same age as her cousin Kyōsuke. She is rather tomboyish, and both Komatsu and Hatta are intimidated by her. Akane can use "The Power" to make people see illusions. She has only been seen using this power to make herself appear as different people; it is unknown if she can create other types of illusions. The illusions appear to be both aural and visual. In the manga, this power works only on the person it is directed towards, so it is probably a mixture of telepathy and hypnosis, elements of "The Power" which have been demonstrated in other members of the Kasuga family. In the anime she uses it on both Hatta and Komatsu at the same time. In the manga she develops a crush on Madoka, to the point of giving Kyosuke a hickey while dreaming about Madoka. This leads to more than a few situations where she creates an illusion of herself as Kyosuke in an attempt to determine just how the two of them feel about each other. Most of these situations end poorly for her and surprisingly, positively for Kyosuke. 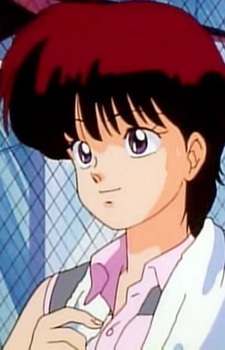 In the anime Akane has the same powers that Kyōsuke and the twins have, in addition to her illusion power. It is never indicated if this is true in the manga. Akane's appearance in the manga and anime are quite different. In the manga she looks like a cross between Kurumi and Manami. In the anime her hair is shorter and darker, her face is more stark, and she has violet eyes. Akane only appeared in two of the OVAs (where she is shown to be rather infatuated with Madoka), and never in the TV series. She appears considerably more often in the manga, almost being a regular.